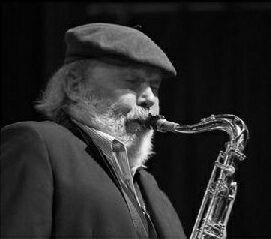 Don Weller is a veteran of the British jazz scene as a tenor sax player, composer and band leader. He is a festival favourite and his big band has to be heard. Besides leading his own groups he began a long association with Stan Tracey... in 1976 and recorded with a number of Stan's groups through the 1970s, '80s and '90s. He also worked and recorded with Clark Tracey and vocalist Tina May in the 1990s. Don Weller has led his own groups, often quartets with Bryan Spring, and a quintet with tenor player Art Themen. Through his long career he has worked with many well known jazz names including Alan Barnes and Bobby Wellins. Don Weller (ts), Michael Garrick (p), Chris Lawrence (b), Alan Jackson (d). Third Floor Richard*/You've Changed*/Rhythm-a-ning*/Like Someone In Love*/Michael's Song*/On Green Dolphin Street*/Soft Awakening. Don Weller (ts), Martin Blackwell (p), Roy Babbington (b), Bryan Spring (d). Smudgley/Fruit/Like Someone In Love/Commit No Nuisance/young Mum's Bum's/you've Changed. Don Weller (ts), Mick Pyne (p), Ron Mathewson (b), Mark Taylor (d). Another Nice Mess/Space In time/Di's Waltz/Red Zinger/A Little Blue/Nothing Less Than Love. Gerard Presencer, Henry Lowther, Steve Waterman, Patrick White (tp), Mark Nightingale, Malcolm Griffiths, Pete Beachill, Andy Fawbert (tb), Peter King, Nigel Hitchcock (as), Don Weller, Art Themen, Mornington Lockett (ts), Alan Barnes (bs), David Newton (p), Andrew Cleyendert (b), Bryan Spring (d). Four By Three/Fruit/Susa/Bongate Song/Haytiming/Glowsy Roe/High Force. Guy Barker (tp), Mark Nightingale (tb), Don Weller, Iain Dixon (ts), Alan Barnes (cl,as,bs) Dave Newton (p), Andy Cleyndert (b), Clark Tracey (d). What You Will/Faith In Alec/Bootleg Eric/College Groove/Springs Eternal/Blue Trinity. Steve Fishwick (tp), Alan Barnes (as,bs), Don Weller (ts), John Donaldson (p), Alec Dankworth (b), Steve Brown (d). Worksong/Jubilation/Clouds/Dis Here/Azule Serape/Blue Daniel/Dat Dere/Jive Samba. Don Weller (ts), David Newton (p), Andrew Cleyendert (b),Dave Barry (d). The Way You Look Tonight/Skip Trip/The Second Time Around/Ol' Blue Eyes/S'our Song/Zag Zig/Hey There/Legacy/Gloesy Roe. This page was last updated during May, 2016.